This grille design incorporates a central wing motif that defines the Legacy’s Subaru brand identity. The Subaru logo separates a deep central grille shape that is accented by sharp headlamps with a dual vertical-row layout of multiple LED lamps. In addition, the slim, vertical fog lamps set in a large front valance with angular air intakes add a jewel-like touch to the front design. The LEGACY CONCEPT is finished in a special High-luster “Ultimate Silver” paint to accentuate the design's angular shapes. The interior design features a striking four-seat layout that showcases the "High Definition" design theme. Comfort and style are achieved with a mix of touch-screens, cameras and modern surface coverings. The high-tech look blends with comfort through four separate seating areas, a high roofline and generous legroom for all passengers. The center console features a large touch-panel display that concentrates various functions for simplified use, while the flowing shape extends vertically to emphasize the feeling of strength and solidity in union with the exterior. A steering wheel and shift lever have been adapted to accentuate the sporty nature elemental in the Legacy’s DNA. The Legacy was introduced globally in 1989, produced in Japan and Lafayette, Indiana. Since that date until November 2008, the total global production has exceeded 3.6 million vehicles making it Subaru's core model. During that period, Subaru’s core technologies of a Horizontally-Opposed engine and Symmetrical AWD have served to further the basic elements of automotive performance while continuously evolving for unparalleled handling, stability, and safety. 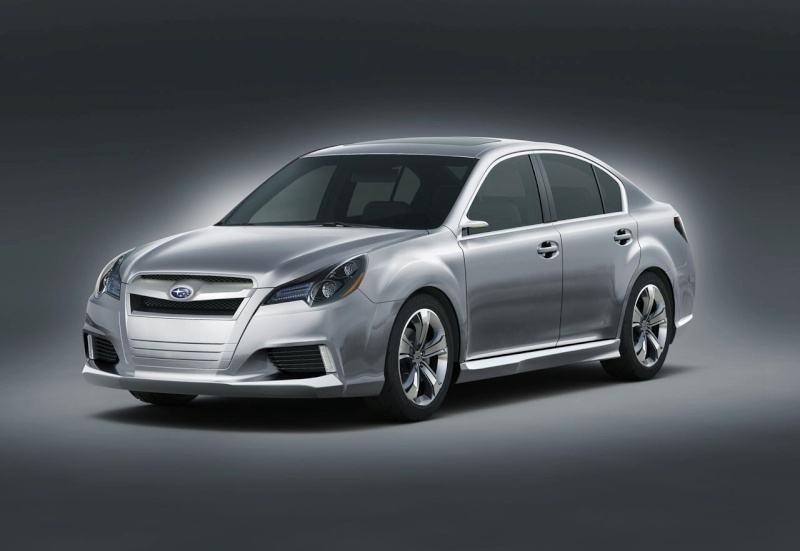 This LEGACY CONCEPT incorporates the Legacy heritage while also serving as a concept model that provides an image of the new driving comfort and reliability that will continue to serve as a touchstone for Subaru.